The Commercial Vehicle Enforcement Division (CVED) within Transportation Safety Services (TSS) is comprised of the Motor Carrier Safety Unit (MCSU), the Towing and Recovery Unit (TRU) and the Motor Vehicle Inspection Unit (MVI). Each of these units works to improve public safety by working with industry to gain compliance with the applicable Federal and State regulations through education and uniform enforcement. The CVED is under the command of a State Police Captain and is staffed by a team of 65 commissioned and 20 non-commissioned personnel under the oversight of the TSS Command Inspector. In 1985, the State of Louisiana entered into an agreement with the United States Department of Transportation (USDOT) to uniformly enforce the Federal Motor Carrier Safety Regulations (FMCSR) and the Federal Hazardous Material Regulations (FHMR). With the formation of the Louisiana State Police (LSP) Motor Carrier Safety Unit (MCSU), the State agreed to strict requirements established by the USDOT for the inspection of commercial motor vehicles and drivers and for the reporting of all applicable data generated from these inspections. The primary objective of Louisiana’s MCSU was to reduce the number and severity of commercial motor vehicle crashes within the State. To facilitate this objective the LSP launched a program of roadside safety inspections, compliance reviews and educational outreach initiatives. Only officers certified by the USDOT may enforce the FMCSR and the FHMR. As part of the LSP Commercial Vehicle Enforcement Division (CVED), the MCSU is further sub-divided into three regional units and an administrative support unit. Organizationally, the MCSU parallels the general organizational structure of the LSP. The unit is staffed full time by 46 commissioned State Troopers, Sergeants, and Lieutenants. Additionally, the MCSU's efforts are being supplemented by commissioned Troopers from the LSP Towing & Recovery and HAZMAT Units and the Mobile Weight Enforcement Unit. The use of mobile data terminals (MDTs) and Aspen software for documentation of roadside inspections enables the rapid upload of inspection data to the Federal Motor Carrier Safety Administration’s Safety and Fitness Electronics Records (SAFER) System. Upon completion of an inspection, officers transmit the data wirelessly to the Department of Public Safety Data Processing Center for immediate upload to SAFER. MCSU inspection officers anywhere in the Nation may access the SAFER System and view any inspection data uploaded to SAFER during the previous 45 days. Such technology allows officers to apprehend violators of out-of-service orders and to identify repeat offenders. The LSP MCSU has long recognized the importance and effectiveness of comprehensive educational initiatives. The LSP, the Louisiana Highway Safety Commission, the Louisiana Motor Transport Association, and the Louisiana Forestry Association often work together to enhance the knowledge of industry and to promote highway safety. Federal programs such as ‘No-Zone’, ‘Be Ready Be Buckled’, and ‘Share the Road’ have been integral components of the LSP MCSU’s efforts. In conjunction with the Drug Interdiction Assistance Program (DIAP), special emphasis is placed on the interdiction of illegal narcotics transported by commercial motor vehicles. Officers making use of specialized interdiction training and narcotics sniffing canines are constantly on the lookout for such shipments. The LSP MCSU Administrative Unit operates out of Baton Rouge, Louisiana. Its primary purpose is to provide administrative and technical support to the three MCSU Regional Offices and to serve as a central repository for all reports generated as a result of MCSU enforcement activities. In addition, the MCSU Administrative Unit also provides support to each of the nine LSP Troops, LSP Headquarters and the trucking industry. If you have any questions or concerns regarding inspection reports, please contact the Administrative Unit at 225-925-3800. Please do not contact the MCSU Regional Offices for information on assessed penalties or fine amounts. The MCSU Region 1 office is located in Baton Rouge, Louisiana and consists of all areas within LSP Troops A, B, and L. The Region 1 telephone number is 225-925-6113. The MCSU Region 2 office is located in Lafayette, Louisiana and consists of all areas within LSP Troops C, D and I. The Region 2 telephone number is 337-262-3315. The MCSU Region 3 office is located in Shreveport, Louisiana and consists of all areas within LSP Troops E, F and G. The Region 3 telephone number is 318-741-7416. Please select one of the versions below. Both versions can be filled in electronically and printed. In 1989, the Louisiana Legislature passed the Louisiana Towing and Storage Act in order to regulate persons and businesses engaged in the towing and/or storing of vehicles in Louisiana. The act provides that the Department of Public Safety and Corrections, Public Safety Services, Office of State Police shall be the regulating agency. The Towing & Recovery Unit (TRU) was created as a result of this legislation and is responsible for the regulation and education of the towing and storage industry. The primary objective of the TRU is to educate those persons and businesses involved in the towing and storage industry to ensure compliance with all applicable rules and regulations. As part of the LSP Commercial Vehicle Enforcement Division (CVED), the TRU is further sub-divided into two regional units. Organizationally, the TRU parallels the general organizational structure of the LSP. The Unit is staffed full time by twelve commissioned LSP Troopers. The TRU is responsible for conducting annual inspections and investigating complaints from the public on all licensed towing and storage facilities, as well as conducting roadside safety inspections on tow trucks. The TRU is also responsible for conducting VIN (Vehicle Identification Number) inspections on all vehicles in need of a VIN plate replacement or an assignment of a VIN on assembled or kit vehicles. Each year, the LSP TRU mandates that Troopers assigned to the Unit participate in a comprehensive training program. During the course of this training, TRU personnel and officials from the Louisiana Office of Motor Vehicles meet to discuss recent changes and trends in the towing and storage industry. Also part of this annual training, the LSP TRU invites representatives of the towing industry to discuss any concerns over regulatory practices as well as ask questions of the Unit’s regulatory policies. If you have any questions or would like to file a complaint concerning a towing or storage facility, please contact the Towing & Recovery Unit Headquarters Office at 225-925-6113 ext. 205 for more information. 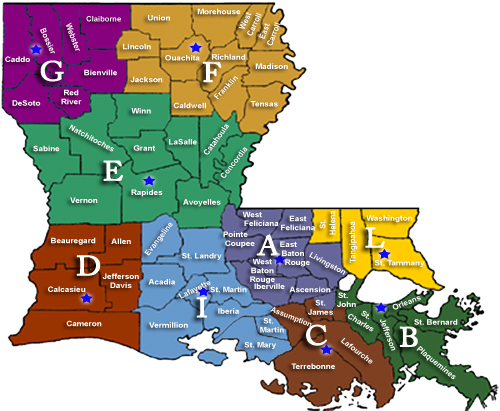 The TRU Region 1 office is located in Baton Rouge, Louisiana and consists of all areas within LSP Troops A, B, and L. The TRU Region 1 telephone number is 225-505-7187. The TRU Region 2 office is located in Lafayette, Louisiana and consists of all areas within LSP Troops C, D, and I. The TRU Region 2 telephone number is 337-262-1638. The TRU Region 3 office is located in Alexandria, Louisiana and consists of all areas within LSP Troops E, F, and G. The TRU Region 3 telephone number is 318-487-5440. The Department of Public Safety, Motor Vehicle Inspection Police Officer is a uniformed commissioned POST certified Peace Officer position and serves as a Louisiana State Police representative. Officers have state wide authority to enforce the criminal and traffic laws of the state, make arrests, and perform other related duties imposed upon them by the legislature as peace officers. Motor Vehicle Inspection authority is derived from the Louisiana Revised Statutes R.S. 32:1301 – 1312. The MVI section works under the Office of State Police within the Transportation and Environmental Safety section of the Patrol Division. The MVI section is currently tasked with the regulation and inspection of all Motor Vehicle Inspection Stations, Approval of Window Tint Waivers (Medical & Security), and performing Motor Carrier Safety Inspections. MVI section consists of officers across the state to conduct required audits on 1700 MVI stations. Contact information 225-925-6113. There are four categories of MVI stations across the state; Public, Dealer, Fleet, and Government. The rules which govern these stations are found under the Louisiana Administrative Code Title 55, Part III. Any new stations must have a physical inspection prior to licensing. All licensed stations are renewed each calendar year and inspected annually. Of the 1700 MVI stations, 182 are in the non-attainment (DEQ) area. These stations are located in the non-attainment area consisting of East Baton Rouge, West Baton Rouge, Livingston, Iberville, and Ascension Parishes. Additionally, MVI officers in this area conduct 1200 bi-annual roadside audits consisting of gas cap & OBDII testing. Once a business has been approved by the department to submit application to become a MVI station, they may send individuals for training to become motor vehicle inspectors. Listed below are the three State approved schools allowed to conduct the training of MVI inspectors. Motor Vehicle Inspection Manual - Scroll and click on the Title 55 section then scroll to the Motor Vehicle Safety Inspections section located under Part III Chapter 8, Subchapters A, B, C, D, and E located on pgs. 151- 178. Prerequisites: Valid medical needs for added protection from the sun, allergies, and/or other sun related medical reasons verifiable by the World Health Organization International Classification of Disease ICD-9-CM. Louisiana residents only may apply. Vehicle(s) to be permitted must be properly licensed and insured in accordance with applicable law. A properly completed FBI Applicant Fingerprint Card - Card can be obtained from any local law enforcement agency. A fee may be charged by the local department. A completed Authorization Form - Print and check the "TESS Window Tint" box. A completed Window Tint Exemption Form - Applicant and physician must complete all designated sections of the application in their entirety and it must be notarized. Only ORIGINAL documents will be accepted. No copies and/or fax copies will be accepted. A cashier check or money order paid to the order of the Department of Public Safety or Louisiana State Police in the amount of $39.25 must be attached to the above documents for processing and mailed to DPS/Window Tint, PO Box 66614 Mail Slip A-26, Baton Rouge, LA 70896. NOTE: Upon approval of the window tint exemption, the vehicle will be issued a numeric window tint exemption sticker. This sticker will be placed on the driver side of the windshield in the lower left hand corner directly above the Louisiana Motor Vehicle Inspection sticker. Security Window Tint Exemption Form - Individuals eligible to apply for a security exemption from the provisions of R.S. 32:361.1 and LAC 55:813 must provide a copy of their current credentials and Louisiana Law Enforcement personnel must provide a copy of their peace officer P.O.S.T. certification and current police commission identification.